Preparations got underway on Saturday afternoon to evacuate a second batch of terrorists who refused to be part of the reconciliation process from Um Batneh village in Quneitra countryside as stipulated by an agreement reached to eliminate terrorist presence in the area. 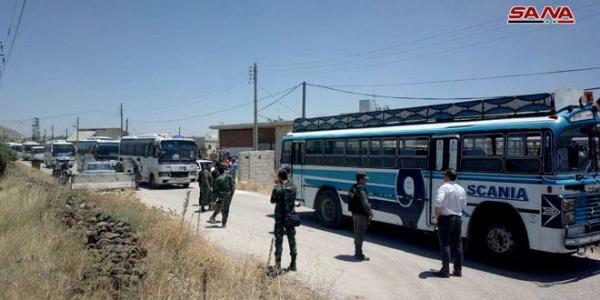 SANA war correspondent said scores of buses have entered the village to evacuate the second batch ahead of transporting them to northern Syria, indicating that the terrorists in the entire Quneitra countryside have been assembled inside the village ahead of evacuating them to northern Syria. 55 buses left on Friday to northern Syria carrying hundreds of terrorists and their families in implementation of an agreement to end terrorist presence in Qunietra countryside’s villages and towns.